Pugsly and I left our little cottage at 3:45pm yesterday and pointed north to a now familiar drive. Before this, I’d been to the Grand Canyon twice. Once when I was around nine years old with my mom and grandparents.I think we arrived at the North Rim. It was somewhere around 1980, and there were no Winnebagos, shopping centers, or crowds of tourists gathering like ants along the Rim. It was quiet. Just us. There was a storm on other side of the Canyon, and I was amazed at how we could so clearly see the rain coming down.A rainbow appeared near the storm and my little child brain nearly exploded with excitement at the sight of such beauty. That trip is what cemented the South West as a Magical Place in my mind. The only other time I’d been to the Canyon was when I was 19. My then-boyfriend and I had traveled from Southern Illinois to spend the summer outside of Albuquerque in Rio Rancho (when it was first being developed. There was a gas station, a handful of new houses, maybe two restaurants, and a grade school). Then we drove from Rio Rancho over to visit friends and family in California. It was just past sunrise when we arrived at the Canyon. Summer of 1989 and there were no tourists watching the morning awaken across the vast…big hole. We weren’t impressed. It was a National Lampoon moment, and we left. I have a feeling that the just-past-sunup light made the Canyon appear flat and diffuse. That, or our sleep-deprived late-teen/early-20s brains didn’t care to take it in. Whatever it was, I hadn’t been back to that big hole until two weekends ago with Pugsly and Kerry doggies. Now, I have been to that Canyon, South Rim, more times in the past couple of weeks than I care. I’m tired of the immense beauty. I’m tired of the cool pines. I would give up ever going back to that natural wonder if Kerry dog would return safely to me. Yesterday was a fruitless search. I knew it would be, but I seem to have a habit of tilting at windmills. Pugsly and I walked the perimeter of the out-of-use water tank fenced in area that connects to the foresty area that borders the Market where I last saw his funny looking old man face. There was no tuft of black hair caught on a pointy fence from where he’d crawled under. Pugsly’s paws didn’t leave any marks in the damp soil, so I know with certainty that lighter Kerry wouldn’t leave tracks. That was my last drive up there to look for Kerry dog. Without a sighting there is truly little I can do but wait. 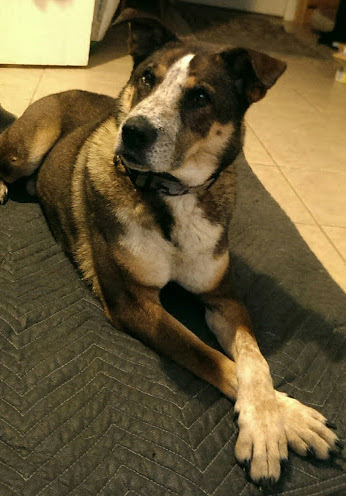 I can keep emailing the Canyon Rangers, localish shelters and rescue groups, and keep his information up on Craigslist and a few ‘lost doggie’ websites. I don’t know that I believe in “Please keep him in your thoughts and envision him safely back home” but I suppose it can’t hurt. If we truly are made up of intertwined and connected particles, then thought is reality and sending those images of Kerry safe and happy in my arms will help. 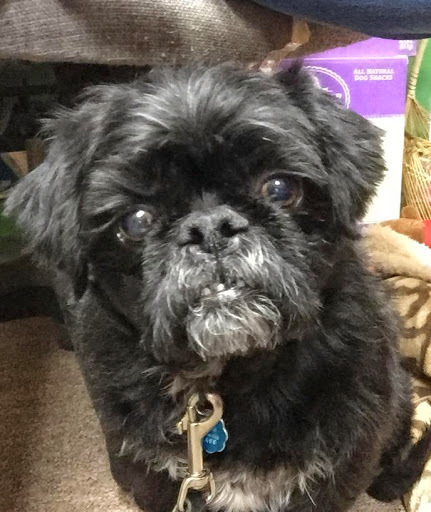 If you believe in a God, perhaps ask for a favor for this sweet little guy who never hurt anyone but was dumped by his owner of nine years to our Rescue Group, and place into my care. Whatever it is to bring him safely home, I’m hoping for that. 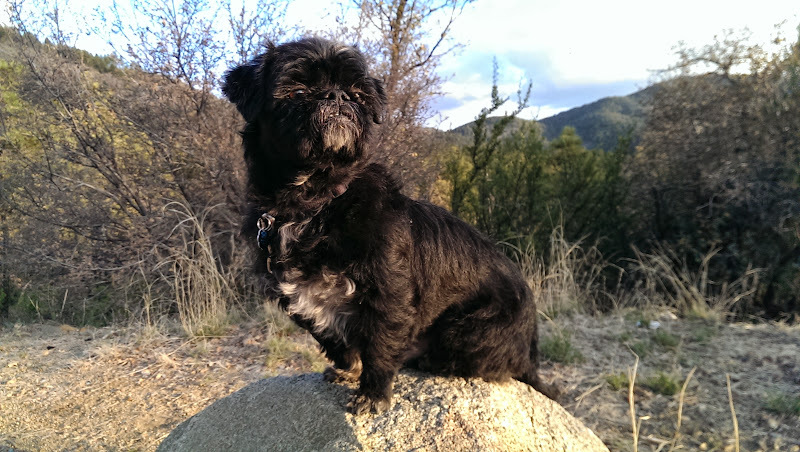 Kerry dog went missing while we were camping at the Grand Canyon Village this past weekend (05/30/2015). He disappeared Saturday morning around 8:30am. If you are going up there, or know anyone who is, please keep an eye out for this timid, sweet, little guy. I’m hoping that his hunger wins out over his fear of people (and everything) and he approaches someone for help. Soon. $500 REWARD for his safe return. Between Market Plaza and up South Entrance Road a couple of miles (not to Central) Maybe near Trailer Village (which is right next to the Market)? He’s very timid, but not aggressive! 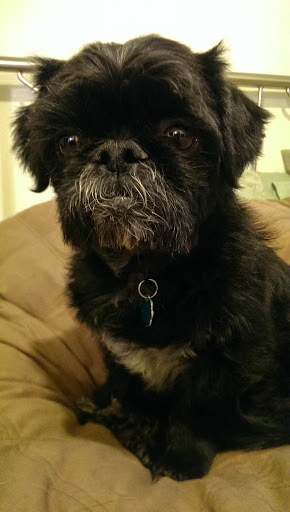 Small black Shih-Tzu x pug mix, KERRY.